It’s safe to say that when its comes to dazzling avant-garde displays of craftsmanship and haute couture, Karl Lagerfeld leads the way. In the past, he’s set up Chanel’s own brand of supermarket, brought a casino to the catwalk (staffed by Julianne Moore, Lily Collins and Kristen Stewart just to name a few), not to mention the airport depature lounge, Terminal Chanel, that he recently created for SS16. 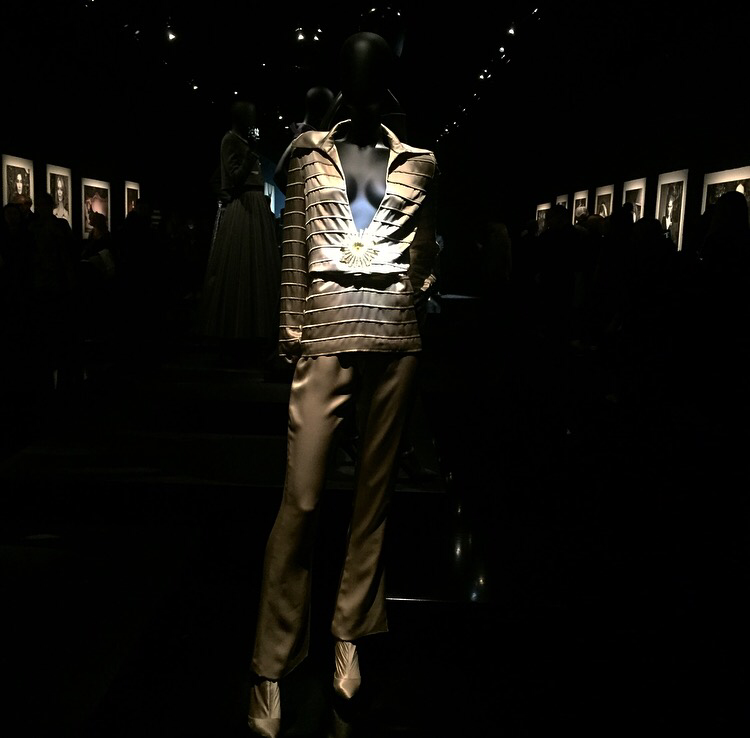 And now he’s staged an immersive journey that takes us into the very heart of the world of Chanel, right from Gabrielle “Coco” Chanel’s early days as a milliner through to Lagerfeld’s modern-day interpretations of her visionary style. 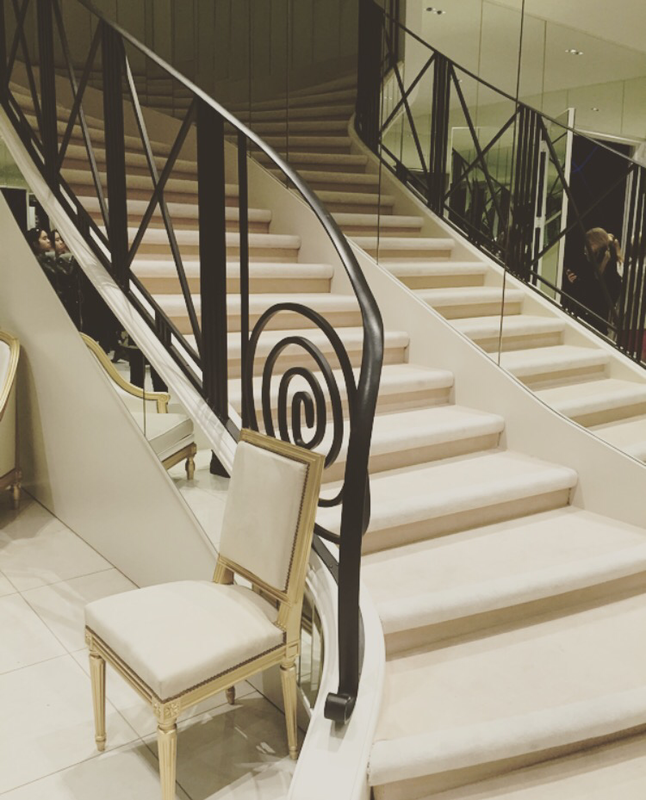 The journey starts at the steps of the mirrored staircase in Chanel’s first boutique at 31 Rue Cambon (the mirrors allowed Coco to discreetly view and gauge the reactions of visitors, whilst she sat hidden away at the top!). 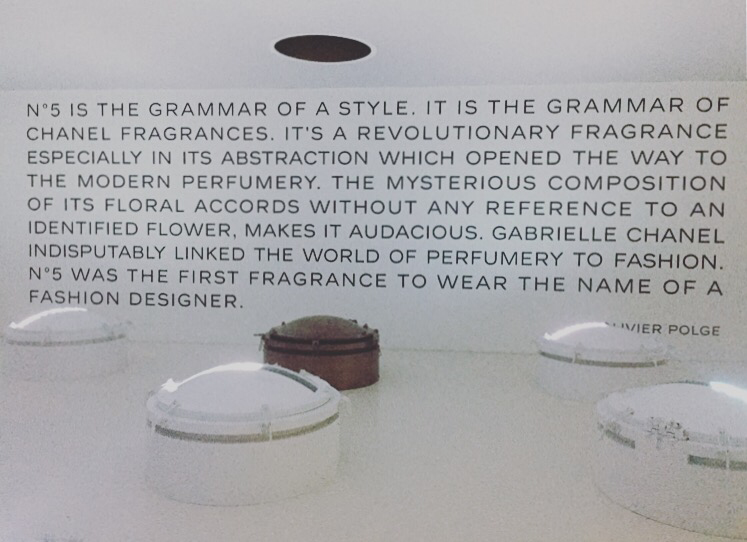 I was initially surprised to see minimal detail in this room – as with most of the other spaces in the exhibit. 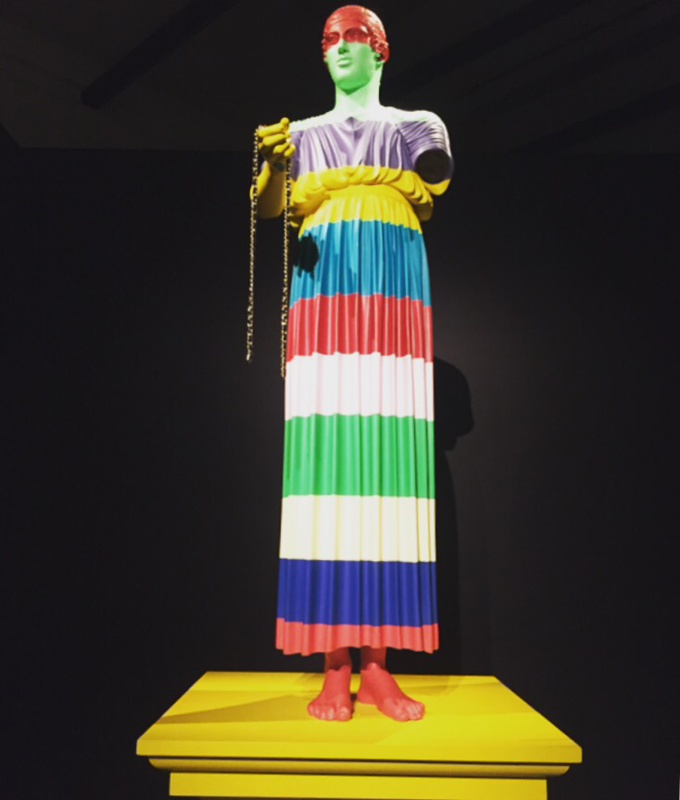 But realised why this was so, as soon as I switched on the Mademoiselle Privé app that the gallery’s staff had strongly encouraged us to download before we entered. Scanning the staircase with my iPhone unlocked a digital tour around Coco’s private apartment, housed above the boutique! I proceeded to explore significant moments and inspirations in Coco’s life (both visually and virtually), including her early days as a milliner when she introduced a lighter and more graceful style at a time when hats were considerably weighed down by fruits, feathers and other fussy accoutrements! Coco Chanel’s innate elegance is embodied throughout the exhibit, in the minimalist approach and attention to detail from the beautifully illustrated sketches to the discreet black trim lacing the floor and ceilings of the white passages connecting the rooms, designed to make us feel as though we are inside a (rather large) Chanel No 5 bottle. 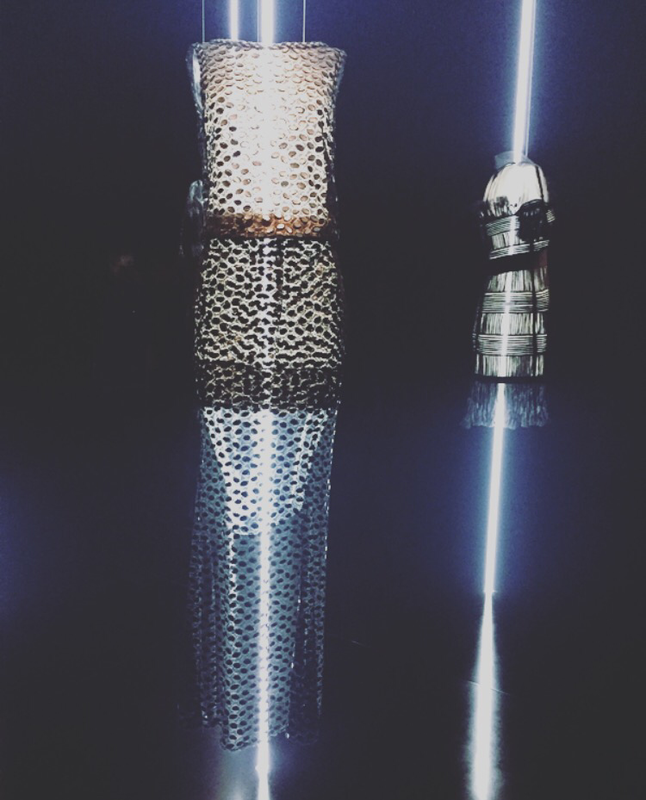 The futuristic vibe carries through upstairs to the collection of haute couture evening dresses showcased on light rods rather than mannequins, to magnify the intricate work. It’s yet another innovative manifestation of how digital technologies have been embraced and integrated into this modern-day exhibit. The juxtaposition of old-age and modern-day glamour particularly shines through in the next room, where some of Lagerfeld’s most iconic evening-wear collection are displayed alongside the dazzling diamond-jewellery collection designed by Coco back in 1932 – in fact, it’s the first time ever that this fine jewellery collection has been shown to the public. Meanwhile, the walls of the room are lined with portraits – photographed by Lagerfeld himself – which show the jewellery modelled by contemporary icons such as Julianne Moore, Keira Knightly, Kristin Stewart, Vanessa Paradis and her daughter Lily-Rose Depp. 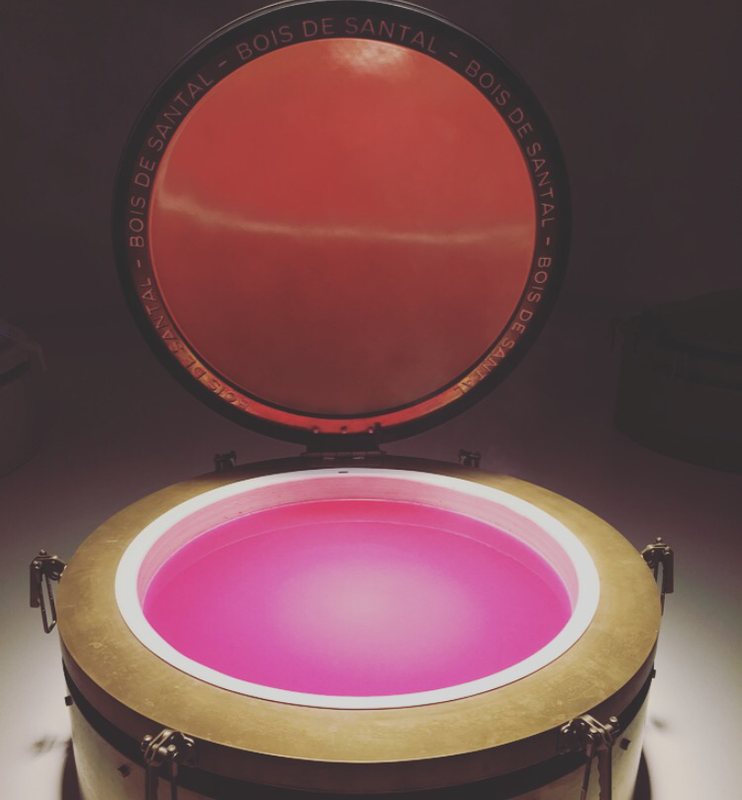 The effect is both enthralling and overpowering – you’re just not sure where to look first! If you’re wondering about what Coco Chanel would make of it all, the answer is imaginatively explored through a short film portraying a conversation between Gabrielle (played by Geraldine Chaplin) who wakes up in her apartment forty years after death, and the frightening (her words, not mine!) Mr. Lagerfeld. He explains that everything he is doing is an endeavour to keep her spirit alive. She’s definitely ruffled – to say the least – by the changes that the fashion house has made to adapt to the times. But is she disappointed, Karl asks? “Yes”, she smiles and is quick to add that she’s happily so. 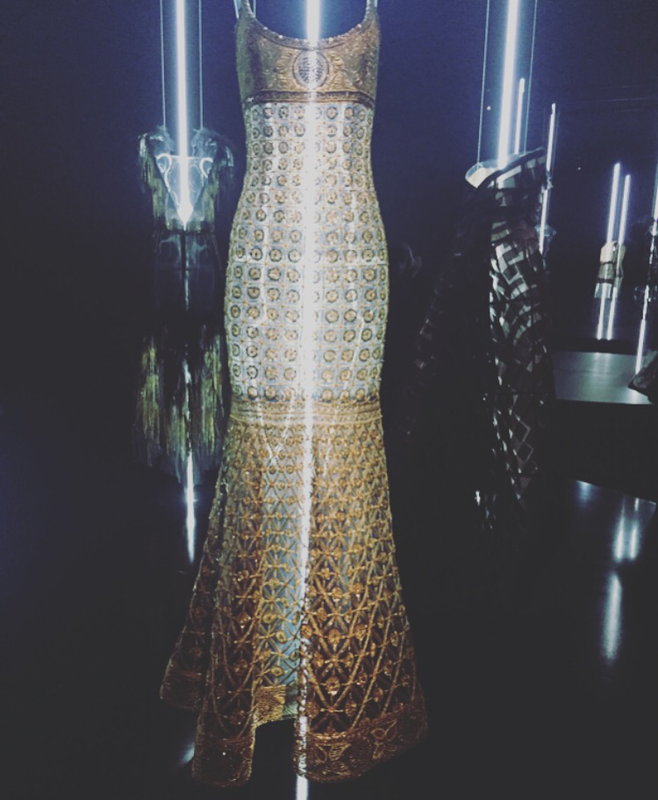 Lagerfeld’s tribute to the symbols created by Gabrielle, is actually one of my favourite parts of the exhibit. Her signature pearls are of course the most classic representation of the fashion house today, but the black line, the colour red, the camellia flower, wheat and Coco’s lucky numbers are also deeply embedded in the brand’s “codes”, reflecting her audacity, free spirit and innovative drive. Feeling inspired and incredibly cheerful, I stepped out into the autumn sunshine a couple of hours later. Wandering through the beautiful gardens (landscaped especially for the exhibit), I found my way to another Parisian export, Cuisine de Bar by Poilâne – a chic eatery tucked away behind Sloane Square. I was just about to order a coffee, but impulsively decided to go with a steaming cup of hot chocolate instead. 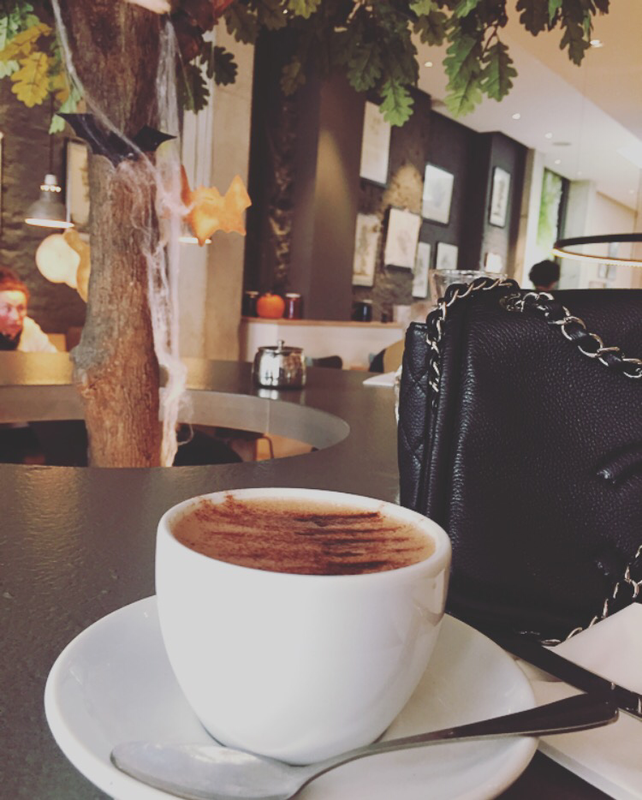 Cocoa and Chanel – definitely the makings of a perfect morning in Chelsea. Wouldn’t you agree?